We are delighted to announce that construction has commenced on 2 x 20,000 sq.ft. 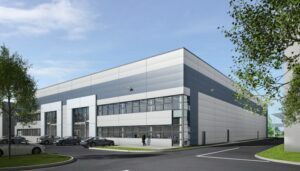 high bay units in North City Business Park. The buildings will be finished to Rohan’s typical high standard and are due for completion in Q4 of this year. These high profile units will have immediate access to the M50/M2 motorway junction (J5) with frontage directly onto the M50. A7A (20,136 sq.ft.) and A7B (20,172 sq.ft.) are high-bay warehouse facilities with approx. 18% office accommodation. These buildings both boast an internal height of 10 metres, an extensive secure service yard, dedicated car parking, two dock levellers each with tailgate loading and each will have one roller shutter door at grade.